In 2019 World Safer Internet Day was celebrated on February 5th under the motto "Together for Better Internet". The fourth-graders at the "Ivan Vazov" Secondary school of Sopot held a lesson in the school library on the topic "Surf safely" to promote the rules for safe surfing on the Internet. The students met the eight golden rules to feel safe on the Internet and watched the educational film: https://abc-promo.com/safe_internet/film.mp4. They then shared and exchanged views and information about useful educational sites and games. The kids were very happy with the book "Surf Safe", a special gift from the author Justin Toms. 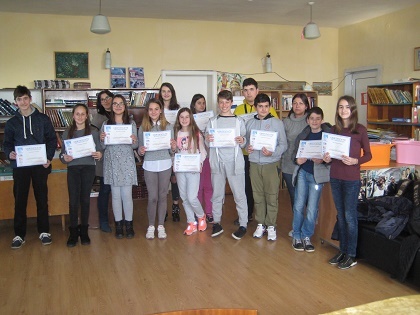 Students from 6th to 12th grade at Sofia University "Ivan Vazov" participated in the ninth National Competition in creative writing in English, organized by the "Housing for Education and Development", supported by the Ministry of Education and Science, the US Embassy in Bulgaria and the American University in Bulgaria. The competition was created to encourage Bulgarian pupils to think creatively, write and have fun in English. The preparation and participation stimulates interest in English, promotes non-standard, different and creative thinking and enables expression.